Host an Event – New Hope, Inc. Third-Party Events are a wonderful way to financially support New Hope while also building awareness for our programs that work to “End Domestic and Sexual Violence in Our Community”. You can host an awareness-building event and donate any proceeds (from ticket sales, donations, etc.) to New Hope. New Hope collects old cell phones, IPhones, Ipads and IPods and recycles them for the benefit of the environment and the financial health of our agency. You can help raise funds for New Hope by coordinating a cell phone drive in your school, business, neighborhood, civic group or place of worship. You can conduct a cell phone collection as part of a longer campaign, or host a single event to which guests bring their used cell phones. Community partners and businesses can also become a permanent cell phone dropoff location. Looking for a team-building activity? 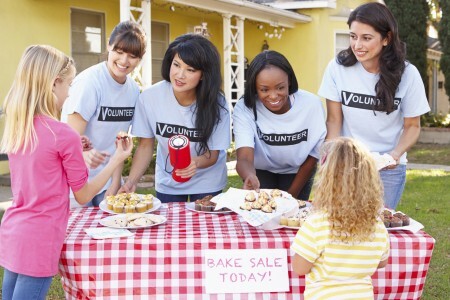 Host a “Day of Caring” with your organization or employees! Days of Caring help New Hope maintain and refresh its physical properties — which helps keeps our expenses down. (Note: Days of Caring might require CORI Background Checks, Confidentiality Agreements and other paperwork). Proceeds can come from specific events (i.e. bake sales, yard sales) or from an ongoing initiative (see below). Many organizations offer “Proceeds From Sales” initiatives during Domestic Violence Awareness Month (October), Teen Dating Violence Awareness Month (February), and Sexual Assault Awareness Month (April). Massachusetts-based Confidence Beads created the “End Violence” bead in support of strong, healthy and safe families and communities. Shop the “End Violence” Collection today and a percentage of your purchase will benefit New Hope programs! New Hope is always in need of non-perishable food for our shelters and clients. Before beginning your food drive, please contact our main office at new-hope@new-hope.org or 508-226-4015 to coordinate current needs and a drop off time.